“To enjoy the rainbow, first enjoy the rain,” said Paulo Coelho, author of The Alchemist. Everyone wants happiness. No one wishes for pain. But we cannot have rainbows without stormy periods or rainy seasons. The question becomes, what do you do when life gets you down? In October 2009, Yen-Lu and Yee Ling Chow experienced the worst kind of nightmare for a parent. It was the heartbreak of having to bury their one and only child, knowing that they have to live without him the rest of their life. At the age of 26, just a few months shy of his graduation from Murdoch University in Australia, their only son, Lawrance Chow, took his own life. He was suffering from manic depression and lost his battle to the illness. Today, Yen-Lu and Yee Ling have turned their grief into a great gift to the world. The couple remembers fondly their son’s compassion for the world as they continue on his legacy, by making a difference to the lives of many. A year after Lawrance’s death, they built a family foundation on youth wellness. Over The Rainbow was launched two years later. 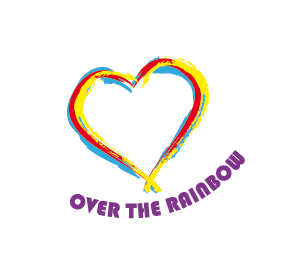 Over the Rainbow (OTR) was set up to raise awareness about depression and other mental illnesses, as well as to create an all-inclusive community of love and compassion. Since its launch, they have touched and inspired countless folks on their own mental wellness journey. Through many projects and initiatives, Yen-Lu and Yee Ling demonstrated the true essence of transformation and hope. Wherever you are in life right now, know that you have within you the strength and the courage to change and create the life that you want. Most importantly, know that you don’t have to struggle through difficult times alone. The fact that you are alive — you are already a gift of this universe. AA: This is a very difficult question for me to ask, but how did you cope with the news on that fateful day? And thereafter, how did you cope with the grief? YL: It was a parent’s worst nightmare. After receiving the call from school, and having to take the overnight flight to Perth Australia – it was the longest flight ever – it felt like eternity. We were hoping somehow that the police, the school, God, had made a mistake – hoping that it wasn’t him. We had to go to the police coronary to identify him. We came face to face with our dreaded fate. Our hearts were broken into a million pieces. The days and weeks and months after were the most difficult times of our life. We were thrown into the deepest and darkest abyss – worse than the purgatory. We were in hell. Getting support and friends and also family, from spiritual healers and others, helped us to slowly come out of those darkest early days after his passing. The first year was very very tough. But early on, we also realized that perhaps that we are not alone – that he was not alone – that there are likely many other young people who have suffered or are suffering from depression or other forms of mental health issues. And we wanted to do something about it. This was that first glimmer of light – it provided a path to move us forward. So rather than focusing on our own grief, pain, sorrow, and suffering, we decided that we would instead try to focus on others’ pain and suffering – and to alleviate their suffering. This was the beginning of our transformation. And this was what our son would have wanted. AA: Can you share if there were any particular event/ person/ place that had helped you during the difficult times of coping with the loss of your son? YL: There wasn’t any particular thing or person, but it was the support over time from friends and family that we received. We also proactively sought help and healing. And rather than heaping blame on ourselves and on each other – to ponder what should have been and what might have been – how we could have done things differently – regrets – which were easy to do during those dark times – and which would have brought us to an even darker place – we decided to support each other – and to focus our attention to help others. This was key for us to begin the healing process. AA: It must have been emotionally painful to have to recall how you both have lost your beloved son. How did you keep yourself ‘strong’ to just keep going? YL: It’s been an ongoing journey to search for new meaning and purpose in life – to discover our true self – to connect to our Higher Self – and to find our common humanity. This is what he wants us to do. We carry him in our heart. AA: What do you think stops people from believing that they can find a way out? From your perspective. YL: First of all, they have to believe that it is possible to be happy – it’s possible to find well-being. But they need to look in the right places – to start from within themselves. Each person has a voice, an innate gift, which needs to find creative self-expression. Each person needs to find his/her own passion. Every one can embark on this journey of self-discovery, healing and transformation, to attain happiness and wellbeing. AA: What is the guiding principle in your life that gives you strength? Can you give me an example of that in action? YL: You can bring light to help brighten the world. You bring light by being the light, the love, the kindness, the compassion, the generosity. Serve as a role model for others. Serve others; create opportunities for others. Always leave a situation better than you first found it. Be the change. AA: How has life changed for you? YL: There’s no pot of gold on the other side (of the rainbow) – but there are nuggets of gold to be uncovered – in yourself – along this life journey. At every twist and turn in life is an opportunity to discover more of these nuggets, out of which we can learn and grow. AA: What have you experienced when you’re making a difference in people’s life? YL: The science of happiness has shown that the best way to make ourselves happy is to make others happy. It gives life meaning – manifesting compassion with wisdom in service of humanity is the highest form of human fulfillment. AA: What do you hope to inspire in others? YL: That happiness is possible – wellbeing is possible. Transformation is possible. They are within your grasp. In fact, happiness is within you. No need to try to find happiness elsewhere. Need to find your purpose, your calling in life – by following your heart. What we give, we get in return. When you plant seeds of happiness, healing, transformation and wellbeing in others – you reap these same rewards.